This post will be a slight departure from the norm, but it should be worth it. A while back, I departed on the adventure of building a Glock-like firearm without using a single Glock OEM part, just for the sake of doing it. Personally, I am much more a CZ person, and have never understood the attraction of Glocks, but I also love building firearms, and the Austrian bricks are some of the most-heavily-supported when it comes to aftermarket parts. That carefully-formed piece of plastic is not legally considered a firearm, given that you cannot currently install the trigger group, recoil assembly, slide, or other essential parts. However, after less than a day of work with a drill press and a few other basic tools, you will have a full-operational Glock-like frame. And if you never sell it, it never even has to be serialized. No doubt the “gun control” extremists are already lining up to figure out a way to shut this company down. Ok, fine, here are the blueprints necessary to build an AR-15 receiver out of sheets of aluminum. No joke. And lest any “gun control” useful idiot get the bright idea of trying to get WordPress to pull down the blueprints, do not fret – I have them backed up on my computer, and will happily host them elsewhere on the internet. Oh, we cannot forget the mad genius who successfully built a fully-operational AK-47-pattern rifle out of an old shovel and junk parts. I am not even close to kidding. It was even capable of keeping all ten spam-can rounds inside the 10-ring at 50 yards. So what are you going to do now, folks? Ban shovels and hammers? You might as well try to ban the Khyber Pass as a whole. For heaven’s sake, jewelers down in “gun control” utopia Australia are supplying bikie gangs with sub-machine guns and silencers. Inmates in German prisons are building shotguns. And apparently staple guns have become a platform of choice for improvised firearms. And that is a core concept that “gun control” extremists simply refuse to comprehend – you cannot ban, restrict, or otherwise regulate firearms in any meaningful way. Or, as some of my friends like to put it, “engineers > politicians”. The truth of the matter is if “gun controllers” get their way and make the ownership of a previously-lawful semi-automatic rifle as illegal as owning an open-bolt, short-barreled, fully-automatic rifle… well, Aisle 6 at your local Home Depot has all the parts necessary to make the latter. And given how easy it is to make the fully-automatic firearm – variations were literally being produced in Warsaw during the Nazi occupation – why would anyone bother with the less-capable rifle? In turn, I think that is a core concept that the pro-rights advocates do not comprehend as well. “Gun control” extremists do not want to regulate firearms. They do not even want to regulate you. They want to destroy knowledge, pure and simple. 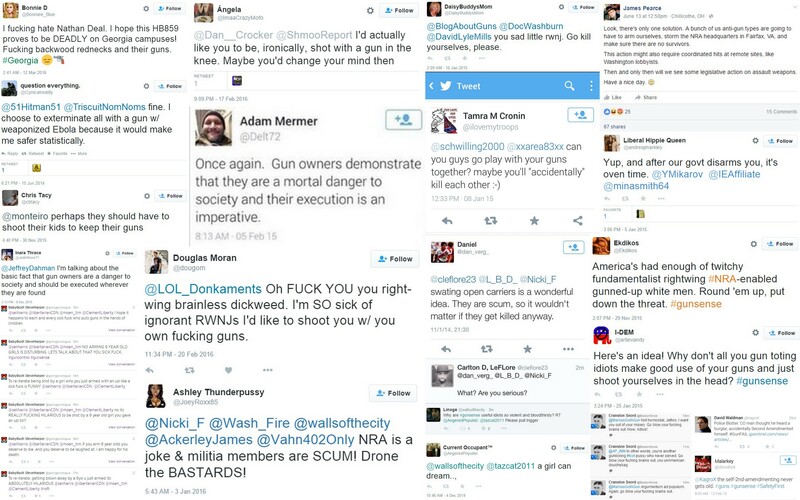 Though, if they could kill a few peaceful, law-abiding Americans along the way, a disturbing number of them would be sanguine with that (and this is a mere sample of the screencaps I have). Not only do they want to ban “assault weapons”, they would be absolutely ecstatic if no one could ever make one ever again. One need only look at their outrage over the Protection of Lawful Commerce in Arms Act for an example of this – “gun control” extremists attempted to use lawfare against firearm manufacturers by suing them over the criminal misuse of their products. The government rightly stepped in and said, “this is dumb,” and the wailing and gnashing of teeth that continues to this day borders on “epic”. To put it another way, “gun control” is another variation – both morally and functionally – to book-burning… but at least the book-burners were – and, sadly, are – more honest about their motivations. And lest you think I am being hyperbolic in my comparison, consider the recent YouTube Terms of Service changes wherein they banned any content that included perfectly-legal activities such as demonstrating how to reload ammunition. The only possible motivation behind this move is to attempt to suppress knowledge and limit its spread – just like with book burnings. But just as the printing press removed the power of book-burners, so too is the internet rendering “gun control” extremists impotent. They can no longer control the narrative. They can no longer massage the message. They can no longer spout their lies unchallenged. The truth will out, whether they want it to or not. That is, after all, one of the reasons I started the “graphics matter” series of posts here – to demonstrate that so much of the information and arguments used by the “gun control” extremists is fundamentally flawed, if not outright dishonest. That is also why such things as the Ghost Gunner exist – the democratization of technology will ultimately render “gun control” a meaningless phrase, and that is why they hate it. And that is part of the reason I like assembling firearms at home. Sure, sue the manufacturers into oblivion. Shut down the FFLs. You cannot stop the signal. So on to the build itself. are gun sales down under president trump yet? graphical representation Create a free website or blog at WordPress.com.